Columbus, Ohio’s Iconic Tonic is another strong act that has been signed to the Jamsync Music label in recent times. After the listening to “Out Loud”, I assumed the band was going to be a straight-ahead party rock band but that’s not the case. Rock And Roll shows off a band that has many influences. The intro “MMXI” gives me a Black Sabbath vibe, possibly something you’d hear from the Tony Martin era. “Out Loud”, of course, is a fun hard rocking number and is one of the singles from the album. Definitely the most obvious choice for airplay. “Zombie Baby” not surprisingly has a bit of Rob Zombie to it while the trippy “Lost At Sea” sounds like something Pink Floyd could’ve done and “Bring You Down” sounds like alternative metal in the vein of Cold or Tool or like something from the last Lizzy Borden album. “Time To Be With You” is done in a Beatles style. 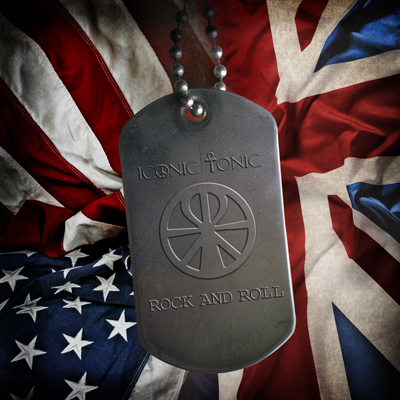 The instrumental “Iconic Tonic” takes us back to a simple hard rock style à la 1970s KISS. While all of these different sounds could make for a schizophrenic and disjointed album in the hands of a lesser band, Iconic Tonic pull it off quite well. I have absolutely no problem with a band experimenting with different styles all on one record just as long as the quality of music is there and the quality is there. You wouldn’t want or expect something like this from a veteran act such as KISS, Black Sabbath or AC/DC but for younger acts just getting their foot in the door, it’s good to experiment (just like college!) and find out where your heart and potential truly lies. All told, Rock And Roll is just that: rock ‘n’ roll. Sure, each song may have a different flavor but if you’re into classic rock, ’80s rock, British rock, rock/pop & alternative rock and want to sample it all at once this is the album to do it with.